The Football Association Cup is arguably the most famous domestic cup competition in world football. Better known as simply the FA Cup, the final of contest takes place at the end of the English footballing calendar and is a genuine showpiece event, held at the famous Wembley Stadium. On this page you can find out which teams are involved in this year's FA Cup and what stadiums will be used for the various round draws from the third round onwards. Click on any stadium to see a full and complete ground guide. We’ll tell you all about the competition’s history, the numerous names it’s had over the years thanks to sponsorship deals and some of the better known finals that have happened in the past. We’ll also run you through the competition’s format, from who gets to play in it and when the big boys get involved right the way through to the final and the journeys teams go on to get there. On top of that we’ll also tell you about other interesting bits and bobs, such as statistics, stadium details and even more. Entry into the FA Cup is available for any team down to level 10 of the league system in England. If you’re not sure what that means then you’ve come to the right place. Levels 1-4 are taken up by the 92 clubs that play in the Premier League and the Football League. The language is complicated for this next bit, but levels 5-10 are made up of the hundreds of non-league teams that feature in Steps 1-6 of the National League System. In short, if you’re playing for a team that is more than just The Dog & Duck’s pub side, there’s a good chance you could find yourself playing in the early rounds of the competition. The actual criteria is your side must have played in the FA Cup, the FA Trophy the FA Vase in the past year. Teams must also play at a suitable ground and are sometimes asked to move to bigger more equipt grounds when playing more popular teams. Whether it be naming the leagues, deciding which teams are eligible to play in what competition or deciding upon the rules to a game, the English don’t like to do anything too simplistically. Qualification for the FA Cup also falls into this bracket, with a mini-tournament taking place before the competition proper gets underway. Even though teams aren’t officially seeded for the various draws that take place, the bigger teams don’t enter the competition until later on, meaning the smaller teams get a chance to go far in it before most are swatted aside. These early rounds are also regionalised, meaning that non-league sides don’t have to pay a fortune in travel costs for a competition they’re not going to win. There are twelve rounds to the FA Cup, with the first six making up the Qualifying Competition. This is where the non-league sides go head-to-head to figure out who will advance through to the competition proper, with 32 teams progressing to the point where they meet the first of the professional teams that make up ‘The 92’. The cup is a knockout tournament from the word go, with lower league teams added on a gradual basis round by round. The 32 teams that progress from the early rounds are joined in the First Round Proper by the 48 teams from League One and League Two. After those teams have been randomly drawn to face each other, forty teams progress to the Second Round where no more teams join the competition. This is essentially a ‘weeding out process’, where the non-league teams are put to the sword by the lower league professional teams. Occasionally a smaller team, known as ‘minnows’ gets reasonably far in the cup and everyone loses their head. If they knockout a big team, or enjoy a ‘giant killing’, then things really go to pot. No non-league side has managed to reach the quarter-finals in the modern era, however. Forty teams play each other in the Second Round but only twenty emerge victorious. They are then joined in the Third Round by the twenty-four teams from the Championship and the twenty teams from the Premier League. This is when the competition gets serious and really starts to heat up. The problem for a lot of the ‘big’ teams, especially from the Premier League, is that the FA Cup joins a heavy fixture schedule that could also involve the Champions League, the Europa League or the League Cup. for this reason a number of teams will play ‘weakened sides’ in the early rounds of the competition, hoping that they will get the added bonus of progression in the cup and a chance to give their younger or fringe players some experience. Of the sixty-four teams that went head-to-head in the Third Round, only 32 make it through to the Fourth Round. Both Third and Fourth Rounds are typically played in January, so an already hectic fixture schedule thanks to Christmas can become unbearable for some teams. The FA Cup is not a competition for the weak willed, with drawn matches involving a replay, with extra-time and penalties being necessary if the two teams still can’t be decided after two games. Sixteen teams progress to the Fifth Round. The draws for the rounds take place after the fixtures from the previous round have been played, even if the ties haven’t been settled. Let’s say Manchester United drew 0-0 with Exeter City in the Fourth Round, for example, with their replay due to take place on January the 28th. The draw for the Fifth Round could take place on the 26th of January, meaning that the two teams know who they will have to play against if they make it further in the competition before they’ve even had their tie settled. It can give teams inspiration, with the knowledge that they’d face a rival team in the next round driving them on to success. The Sixth Round is the quarter-final stage of the competition, in which the remaining eight teams go head-to-head to decide who will make the semi-finals. The Fifth Round matches tend to take place in February and the Sixth Round games a played in March. This is the last round in which games are played at the home ground of one of the teams playing. The first name out of the hat when the draw is made hosts the match, with replays being played at the home of the away team. Once the dust has settled at the end of the Sixth Round, four teams progress to the Semi-Final stage of the competition. The Semi-Finals have traditionally always been played at a ‘neutral venue’, with numerous grounds such as Villa Park, Old Trafford and Hillsborough being used on a regular basis. Since the opening of the new version of Wembley Stadium, however, the Semi-Finals have been played at the home of the England international team. Many people have been critical of this decision by the FA, suggesting that it’s only been done in order to allow them to raise money to pay for the stadium. Those opposed to the use of Wembley suggest it takes the shine of reaching the final, having already played a game there. Like when the X-Factor introduced live auditions, there’s nothing for teams to get excited about and no journey for them to go on. the Semi-Finals are played in April and the games are decided on the day. If there is no winner at the end of ninety minutes then the match goes to extra-time and penalties in order to decide who will make the Final. Two teams return to Wembley at the end of May to fight it out for the right to lift the FA Cup trophy high in the air. Typically the final is played the Saturday after the end of the Premier League season, though there have been a couple of exceptions to this rule. In the 2012-2013 season, for example, Wembley was used to host the Champions League final, so the FA Cup final was held before the end of the Premier League season in order to allow the stadium to be made ready for the final of the European showpiece tournament. The final has not always been held at Wembley, with Cardiff’s Millennium Stadium used regularly whilst Wembley was knocked down and the new Wembley built on the same site. The winners of the FA Cup qualify for the group stages of the following season’s Europa League, presuming that they haven’t already qualified for either that or the Champions League through their league performance. The winner also plays in the FA Community Shield against the team that won the Premier League in the same season. The Community Shield is a friendly match that is typically seen as the ‘curtain raiser’ for the season ahead. When football was first being properly established in England there were countless different versions of the rules being played by teams who took part in games. In 1863 the Football Association was established with the aim of solidifying the rules that teams played by, producing a booklet entitled ‘The Laws Of The Game Of Association Football’. In 1871 the FA’s Secretary, C. W. Alcock, wrote a letter to the rest of the FA stating, “It is desirable that a Challenge Cup should be established in connection with the Association for which all clubs belonging to the Association should be invited to compete”. And with those words, the FA Cup was born. The first ever iteration of the oldest association football cup competition in the world kicked off in November of 1871, though it was a lot less complicated an affair than it is nowadays. Just thirteen games had to be played in order for Wanderers to be named as the first ever winners, with the final being played on the 16th of March 1872. They went on to win it again the following year and the cup as we recognise it today didn’t go on to be formed until qualifying rounds were first introduced for the 1888-1889 season. Until the early 1990s FA Cup ties had to be decided within ninety minutes of football. That meant that if the tie wasn’t settled after the original match had been played then it had to go to a replay. If that game didn’t settle the tie then it would be replayed again and again until an outright winner was found. In the past as many as six replays were played in order to get a winner. In fact, Fulham’s 1975 campaign saw them have to play twelve matches over six rounds to be able to reach the final. The idea of the replay still exists today, though only one replay is necessary to decide who will progress in the competition. If the two teams can’t be separated after 180 minutes of football then the game will go to extra-time and, if necessary, penalties. Historically neither the Semi-Finals nor the Final were immune from replays and the cup has been won on a replay fourteen teams in its history. The first Final replay was as early as 1875, when Royal Engineers beat Old Etonians at the second time of asking. The most recent final replay was in 1993, when Arsenal were victorious over Sheffield Wednesday. Nowadays the Semi-Finals and Final are the only games that don't have to go to replays, as extra-time and penalties are played at the end of ninety minutes of those games to find a winner. In the past the replays would be three or four days after the original time, but police advice meant that was switched to at least ten days later from the 1991-1992 season. The first ever FA Cup penalty shoot-out took place on the 26th of November 1991 when Rotherham United knocked out Scunthorpe United by that method. As we’ve already mentioned, Wembley Stadium plays a large part in the mystique of the FA Cup. The first cup final to be played at the old Wembley was on the 28th of April 1923, just four days after the building was completed. Originally called The British Empire Exhibition Stadium but known simple as Empire Stadium, the FA incredibly decided against ticketing that first match between Bolton Wanderers and West Ham United. Prior to the opening of Wembley the FA Cup Final was held in a number of locations, most notably Kennington Oval and Crystal Palace, though Old Trafford, Bramall Lane and Stamford Bridge were all also used. From Wembley’s opening in 1923 through to its closing in 2000 Wembley held every FA Cup Final apart from one - the replay of 1970’s match between Chelsea and Leeds United that was played at Old Trafford. The last FA Cup Final to be held at the old Wembley took place on the 20th May 2000, with Chelsea beating Aston Villa thanks to a second-half goal from Roberto Di Matteo. The Final then spent the next six years being played at the Millennium Stadium in Cardiff whilst the new Wembley was being built. The inaugural Final there saw Liverpool beat Arsenal 2-1 as they were on their way to a unique FA Cup, League Cup and UEFA Cup treble. Fittingly Liverpool also won the last FA Cup Final at the Millennium Stadium in 2006, with Steven Gerrard famously scoring an incredible last minute goal to take the game to extra-time and then penalties. The match finished 3-3 in normal time and has since become known as ‘The Steven Gerrard Final’. The Wembley Stadium that we now and recognise nowadays hosted its first FA Cup Final in 2007 when Chelsea beat Manchester United 1-0. It has been a happy hunting ground for the West London club, with the Blues having won four out of the ten finals that have been played there to date. Designed by HOK Sport amongst others, the 90,000 capacity makes it the largest ground in England. 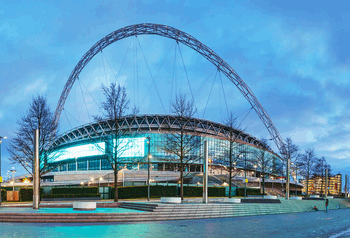 The famous twin towers no longer stand outside the ground, but a large arch is the new showpiece bit of architecture that you should look out for on your walk along Wembley Way. No conversation about the FA Cup would be complete without mention of the Hillsborough Disaster, the greatest British sporting disaster of all time. Though we couldn’t possibly give you an in-depth report into it here, it’s important that we at least give you a brief overview of how 96 innocent football fans lost their lives. The disaster occurred on the 15th of April 1989 during a match between Nottingham Forest and Liverpool. It was the Semi-Final of the FA Cup and the game took place at Hillsborough Stadium. Catastrophic police failings coupled with an entirely unsuitable venue and other poor decisions from members of authority, such as the FA’s failure to ensure the stadium had a valid safety certificate, led to too many fans being forced into over-crowded pens after the match commander, Chief Superintendent David Duckenfield, ordered an exit gate to be opened. What followed was a human crush that killed 96 people and left over 750 others with serious injuries. In an attempt to hide their failings, members of the police initiated a cover-up that placed the blame on Liverpool fans themselves, despite the fact that the supporters at the ground on the day were nothing short of heroes. Senior police officers leaked false information to the press, with The Sun newspaper famously printing a copy with the headline “The Truth”, followed by nothing but outrageous lies. The stories that vilified the Liverpool fans were disproved almost immediately, though the damage had been done and many members of the general public believes the lies of the police. The initial inquest into the deaths declared that they were ‘Accidental’, however the victims’ families refusing to accept that no one was to blame for the loss of their loved ones. Remarkably it took another 27 years before a fresh inquest delivered the correct verdict of ‘Unlawful Killing’, exonerating the fans of any blame and putting the fault of the disaster squarely at the foot of the police. The aftermath of the disaster led to numerous changes to the way football was ran in the United Kingdom, with all-seater stadiums introduced to replace the standing terraces that had existed before. It also led to the removal of spectator fencing that had been introduced to stop pitch invasions but merely stopped the fans being able to escape from the pens at Hillsborough. Sadly it has also led to some Draconian rules that remain in place, such as the inability of fans to drink within sight of the football pitch, despite the fact that it has been categorically proven that alcohol consumption played no part whatsoever in the disaster. If you are under any doubts about the seriousness of Hillsborough and the cover-up that followed then we urge you to research the disaster thoroughly. There are numerous excellent sources you can turn to, including the book “Hillsborough: The Truth” by professor Phil Scraton, the Jimmy McGovern docudrama and the 2014/2016 documentary into the disaster. The cover-up was initiated by the police on the day and given credence by the politicians of the time. Hillsborough was not only the worst sporting disaster in British history but also the biggest national disgrace of our time. Given that Football League and Premier League teams automatically qualify for the FA Cup and non-league teams are also eligible to enter the early rounds as long as they know someone whose initials are F and A, it’s rare that a team decides not to participate in the competition. It’s even rarer for the holders of the cup not to enter, yet in the 1999-2000 season that is exactly what happened. Manchester United completed a unique treble in the 1998-1999 season when they won the FA Cup, the Premier League and the Champions League. The Champions League victory meant they qualified for the Club World Championship the following season, leaving them with a difficult choice to make. They were afraid that fixture congestion would cause them to falter in their defence of the league and the Champions League and they didn’t want to ‘devalue the FA Cup’ by playing weaker teams in the competition. The result was that Manchester United did not enter the FA Cup in the 1999-2000 season, instead entering the World Club Championship, the Premier League and the Champions League. The FA Cup trophy is presented to the winner of the competition, with the winning team entitled to hold on to it as a ‘loan’ from the FA until the 1st of March of the year following the final. There have only been two designs of the FA Cup, though five different physical trophies have been in existence. The original trophy, known as ‘the little tin idol’, was just 18 inches in height and was stolen in 1895 and never found. It was replaced by a replica that was used until 1910 when Manchester United had their own replica of it made, leading the Football Association to realise they didn’t own the copyright for the trophy. The design that we know and love nowadays was introduced in 1911 and has been used ever since. A replica was built in 1992 in order to preserve the original trophy. The replica itself was replace in 2014 with a heavier version, having suffered the signs of wear and tear from two decades worth of use. The trophy is in three parts: The cup, a lid and the base. The name of the winner is engraved on the base of the trophy after the end of the match and before the presentation of it to the winning team, that normally occurs at the Royal Box.